This tilapia dish is a stewed tilapia with coconut milk. Cooking fish in coconut milk is one of the many popular Filipino dishes. Tilapia is also the common fish served because it is the cheapest and there are many kinds of dishes that can be cooked. Preparing this dish is also very easy, you just put everything in the pan and let it simmer until the fish is done. The extra step on this recipe is sauteing the garlic and ginger along with the fish to improve the taste and lessen the fishy odor of the dish. But you can omit this step depending on your preference. To cook ginataang tilapia; In a medium size pan, heat corn oil and saute garlic and ginger until fragrant. Add the tilapia and let it sizzle for a few minutes. Turning the fish until the skin changes it’s color. Add the chopped onions and vinegar, do not stir. Add black peppercorns, salt, fish sauce, bay leaves and siling labuyo. Then pour the coconut milk and let it simmer for about 10 minutes. Serve hot. You can also garnish it by arranging Chinese cabbage leaves on a platter then put the tilapia on it and pour some sauce. To see the complete recipe, continue reading. This tilapia dish is a stewed tilapia with coconut milk. In a medium size pan, heat corn oil and saute garlic and ginger until fragrant. Add the tilapia and let it sizzle for a few minutes. Turning the fish until the skin changes it's color. Add the chopped onions and vinegar, do not stir. Add black peppercorns, salt, fish sauce, bay leaves and siling labuyo. Then pour the coconut milk and let it simmer for about 10 minutes. Serve hot. You can also garnish it by arranging Chinese cabbage leaves on a platter then put the tilapia on it and pour some sauce. 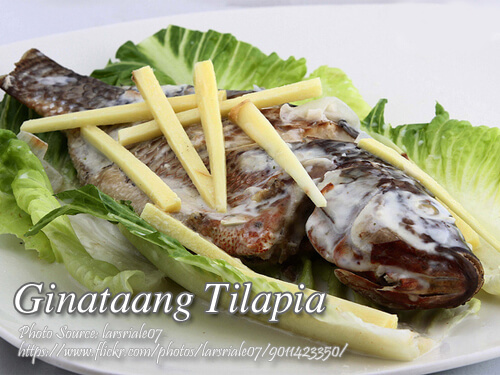 Thanks for sharing this ginataang tilapia recipe!